Electricity (from Greek ήλεκτρον (electron) "amber") is a general term for the variety of phenomena resulting from the presence and flow of electric charge. Together with magnetism, it constitutes the fundamental interaction known as electromagnetism. 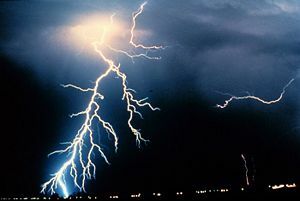 It includes several well-known physical phenomena, such as lightning, electric fields, and electric currents. Electricity requires setting up a circuit between positively charged and negatively charged poles. As such, it is a prime example of a general principle that energy of any kind is predicated upon the relationship between subject and object entities. Human ability to harness electricity is one of the keys for the establishment of modern technological society. Thus, electricity is used for lighting, communications, transportation, industrial machinery, power tools, appliances, elevators, computers, and an expanding variety of electronic goods. Lightning strikes during a night-time thunderstorm. As powerful electric currents flow through the Earth's atmosphere, energy is radiated as light. The ancient Greeks and Parthians knew of static electricity from rubbing objects against fur. The ancient Babylonians may have had some knowledge of electroplating, based on the discovery of the Baghdad Battery, which resembles a Galvanic cell. It was Italian physician Girolamo Cardano in De Subtilitate (1550) who is credited with distinguishing, perhaps for the first time, between electrical and magnetic forces. In 1600, the English scientist William Gilbert, in De Magnete, expanded on Cardano's work and coined the New Latin word electricus from ἤλεκτρον (elektron), the Greek word for "amber." The first usage of the word electricity is ascribed to Sir Thomas Browne in his 1646 work, Pseudodoxia Epidemica. Gilbert was followed, in 1660, by Otto von Guericke, who invented an early electrostatic generator. Other pioneers were Robert Boyle, who in 1675, stated that electric attraction and repulsion can act across a vacuum; Stephen Gray, who in 1729, classified materials as conductors and insulators; and C.F. Du Fay, who first identified the two types of electricity that would later be called positive and negative. The Leyden jar, a type of capacitor for electrical energy in large quantities, was invented at Leiden University by Pieter van Musschenbroek in 1745. William Watson, experimenting with the Leyden jar, discovered in 1747, that a discharge of static electricity was equivalent to an electric current. In June 1752, Benjamin Franklin promoted his investigations of electricity and theories through the famous, though extremely dangerous, experiment of flying a kite during a thunderstorm. Following these experiments he invented a lightning rod and established the link between lightning and electricity. If Franklin did fly a kite in a storm, he did not do it the way it is often described (as it would have been dramatic, but fatal). It is either Franklin (more frequently) or Ebenezer Kinnersley of Philadelphia (less frequently) who is considered as responsible for establishing the convention of positive and negative electricity. Franklin's observations aided later scientists such as Michael Faraday, Luigi Galvani, Alessandro Volta, André-Marie Ampère, and Georg Simon Ohm whose work provided the basis for modern electrical technology. The work of Faraday, Volta, Ampère, and Ohm is honored by society, in that fundamental units of electrical measurement are named after them. Volta discovered that chemical reactions could be used to create positively charged anodes and negatively charged cathodes. When a conductor was attached between these, the difference in the electrical potential (also known as voltage) drove a current between them through the conductor. The potential difference between two points is measured in units of volts in recognition of Volta's work. In 1800, Volta constructed the first device to produce a large electric current, later known as the electric battery. Napoleon, informed of his works, summoned him in 1801, for a command performance of his experiments. He received many medals and decorations, including the Legion of Honor. By the end of the nineteenth century, electrical engineering had become a distinct professional discipline and electrical engineers were considered separate from physicists and inventors. They created companies that investigated, developed and perfected the techniques of electricity transmission, and gained support from governments all over the world for starting the first worldwide electrical telecommunication network, the telegraph network. Pioneers in this field included Werner von Siemens, founder of Siemens AG in 1847, and John Pender, founder of Cable & Wireless. 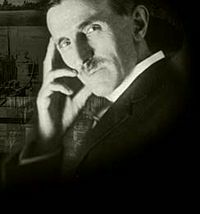 The late nineteenth and early twentieth century produced such giants of electrical engineering as Nikola Tesla, inventor of the polyphase induction motor; Samuel Morse, inventor of a long-range telegraph; Antonio Meucci, an inventor of the telephone; Thomas Edison, inventor of the first commercial electrical energy distribution network; George Westinghouse, inventor of the electric locomotive; Charles Steinmetz, theoretician of alternating current; Alexander Graham Bell, another inventor of the telephone and founder of a successful telephone business. The rapid advance of electrical technology in the latter nineteenth and early twentieth centuries led to commercial rivalries, such as the so-called “War of the Currents” between Edison's direct-current (DC) system and Westinghouse's alternating-current (AC) method. The term electricity involves several related concepts, defined below. Electric charge is a property of certain subatomic particles (for example, electrons and protons) which interacts with electromagnetic fields and causes attractive and repulsive forces between them. Electric charge gives rise to one of the four fundamental forces of nature, and is a conserved property of matter that can be quantified. In this sense, the phrase "quantity of electricity" is used interchangeably with the phrases "charge of electricity" and "quantity of charge." There are two types of charge: Positive and negative. Through experimentation, one finds that like-charged objects repel and opposite-charged objects attract one another. The magnitude of the force of attraction or repulsion is given by Coulomb's law. The space surrounding an electric charge has a property called an electric field. This electric field exerts a force on other electrically charged objects. 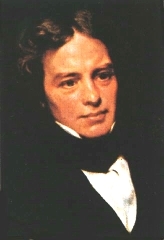 The concept of electric fields was introduced by Michael Faraday. Illustration of the electric vector field surrounding two opposite point charges. Red is positive, green is negative. An electric field is a vector with SI units of newtons per coulomb (N C-1) or, equivalently, volts per meter (V m-1). The direction of the field at a point is defined by the direction of the electric force exerted on a positive test charge placed at that point. The strength of the field is defined by the ratio of the electric force on a charge at a point to the magnitude of the charge placed at that point. Electric fields contain electrical energy with energy density proportional to the square of the field intensity. The electric field is to charge as acceleration is to mass and force density is to volume. The electrical field force acts between two charges, in the same way that the gravitational field force acts between two masses. However, the electric field is a little bit different. Gravitational force depends on the masses of two bodies, whereas electric force depends on the magnitude of electric charges of two bodies. While gravity can only pull two masses together, the electric force can be an attractive or repulsive force. If both charges are of same sign (for example, both positive), there will be a repulsive force between the two. If the charges are opposite, there will be an attractive force between the two bodies. The magnitude of the force varies inversely with the square of the distance between the two bodies, and is also proportional to the product of the unsigned magnitudes of the two charges. The difference in electric potential between two points is called voltage. It is a measure of the capacity of an electric field to cause an electric current to flow through an electrical conductor. The difference in electric potential is defined as the work done per unit charge (against electrical forces) in moving a positive point charge slowly between two points. If one of the points is taken to be a reference point with zero potential, then the electric potential at any point can be defined in terms of the work done per unit charge in moving a positive point charge from that reference point to the point at which the potential is to be determined. For isolated charges, the reference point is usually taken to be infinity. 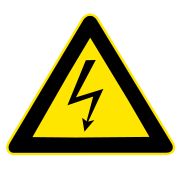 Voltage is measured in volts (1 volt = 1 joule/coulomb). The electric potential is analogous to temperature: There is a different temperature at every point in space, and the temperature gradient indicates the direction and magnitude of the driving force behind heat flow. Similarly, there is an electric potential at every point in space, and its gradient indicates the direction and magnitude of the driving force behind charge movement. An electric current is a flow of electric charge and is measured in amperes. Examples of electric currents include metallic conduction, where electrons flow through a conductor or conductors such as a metal wire, and electrolysis, where ions (charged atoms) flow through liquids. The particles themselves often move quite slowly, while the electric field that drives them propagates at close to the speed of light. A direct current (DC) is a unidirectional flow, while an alternating current (AC) reverses direction repeatedly. The time average of an alternating current is zero, but its energy capability (RMS value) is not zero. Ohm's law is an important relationship describing the behavior of electric currents, relating them to voltage. For historical reasons, electric current is said to flow from the most positive part of a circuit to the most negative part. The electric current thus defined is called conventional current. It is now known that, depending on the conditions, an electric current can consist of a flow of charged particles in either direction or even in both directions at once. The positive-to-negative convention is widely used to simplify this situation. However, if another definition is used—for example, "electron current"—it should be explicitly stated. Electrical resistance represents the degree to which a device in an electric circuit opposes the passage of an electric current. For any given voltage applied to an electric circuit, the quantity of resistance in the circuit determines the amount of current flowing through the circuit. The relationship between voltage, current, and resistance in an electric circuit can be written as an equation known as Ohm's law, given below. For a wide variety of materials and conditions, the electrical resistance does not depend on the amount of current flowing or the amount of applied voltage. Its reciprocal quantity of electrical resistance is electrical conductance. The SI unit of electrical resistance is the ohm. Electric power is the rate at which electrical energy is produced or consumed, and is measured in watts (W). A fossil-fuel or nuclear power station converts heat to electrical energy, and the faster the station burns fuel, assuming constant efficiency of conversion, the higher its power output. The output of a power station is usually specified in megawatts (millions of watts). The electrical energy is then sent over transmission lines to reach the consumers. Every consumer uses appliances that convert the electrical energy to other forms of energy, such as heat (in electric arc furnaces and electric heaters), light (in light bulbs and fluorescent lamps), or motion, that is, kinetic energy (in electric motors). Like the power station, each appliance is also rated in watts, depending on the rate at which it converts electrical energy into another form. The power station must produce electrical energy at the same rate as all the connected appliances consume it. Non-nuclear electric power is categorized as either green or brown electricity. Green power is a cleaner alternative energy source in comparison to traditional sources, and is derived from renewable energy resources that do not produce any nuclear waste; examples include energy produced from wind, water, solar, thermal, hydro, combustible renewables and waste. Electricity from coal, oil, and natural gas is known as traditional power or "brown" electricity. Ohm's law states that in an electrical circuit, the current passing through a conductor, from one terminal point on the conductor to another, is directly proportional to the potential difference (that is, voltage drop or voltage) across the two terminal points and inversely proportional to the resistance of the conductor between the two points. where I is the current, V is the potential difference, and R is a constant called the resistance. The potential difference is also known as the voltage drop, and is sometimes denoted by E instead of V. This law is usually valid over a large range of values of current and voltage, but it breaks down if conditions (such as temperature) are changed excessively. The SI unit of current is the ampere; that of potential difference is the volt; and that of resistance is the ohm. One ohm is equal to one volt per ampere. The law is named after the physicist Georg Ohm, who published it in a slightly more complex form in 1826. The above equation could not exist until the ohm, a unit of resistance, was defined (1861, 1864). Matter: Atoms and molecules are held together by electric forces between charged particles. The Earth's magnetic field: Created by electric currents circulating in the planet's core. Bioelectricity: Many animals are sensitive to electric fields, some (such as sharks) more than others (such as people). Most also generate their own electric fields. Electricity is used in many of our appliances machines and tools today. Examples include in lighting, communications, industrial machinery, power tools, vehicles, computers, appliances, elevators and many other electronic goods. Electricity is so widely used because of its relative ease of transmission and the ease with which the energy it carries can be harnessed to do useful work. ↑ BBC News, Riddle of 'Baghdad's batteries.’ Retrieved June 27, 2007. Callister, William D. 2006. Materials Science and Engineering: An Introduction. New York: Wiley and Sons. ISBN 0471736961. Saslow, Wayne, and Lane H. Seeley. 2006. Electricity, Magnetism and Light. American Journal of Physics 74 (4): 365. This page was last modified on 18 September 2017, at 21:41.